Anneoung Haseyo (how are you) friends and readers? Hopefully you are in happiness and blessed. Last week I had a plan to write article in this blog about my last year trip to Korea. Before I start to write, I read about a Asia on Air Program Contest for blogger in Twitter of Korea Tourism and the prize is a 5 day tour to Korea, .... So, I hurry write this article. Last year, I visited Korea with my sister, four new friends and eight friends from BIA (my previous workplace), therefore we had a reunion trip in Korea. It is very nice, we visited Mount Sorak, Everland, Teddy Bear Museum, some interesting place in Seoul and off course Nami Island. After I had my first trip to Korea, I said to myself that it will be very nice if I have chance visit Korea again especially in different season. 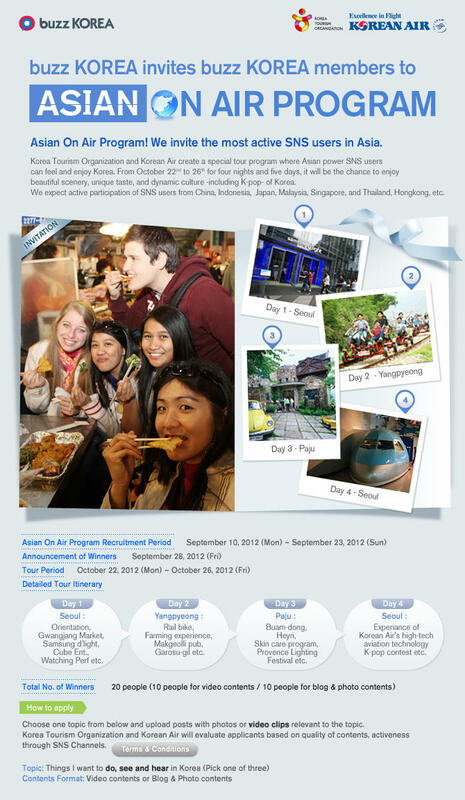 This contest brings a chance to me and other blogger to visit Korea. "Things I want to do, see and hear if I have chance to visit SEOUL, described in five paragraft which are starting with alphabet S-E-O-U-L"
See Korean actors or actress. I saw them in television and they look handsome/pretty, have smooth white skin and cool haircut. In my last trip, I only saw Korean citizen, almost all of them have smooth white skin....I think that I should go to Seoul Plaza to see Korean actors/actress in a concert or other art performance. Eat kim chi. My tour guide said that Kim chi is the Korean flawless skin secrets and slim body. This is a picture whe n I and my friends studied to make kim chi in Kim chi Experience Center in Seoul. 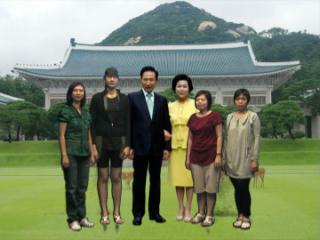 Opportunity to make a real picture with Mr and Mrs President should be propose to Korea Tourism if I win this contest. In my last visit, I had a picture with Mr and Mr President Lee Myun-bak in Cheongwadae Sarangchae Museum, but this is unreal, they took picture and put in a template. Understand Korean History by visiting palace and museum. In my last trip in Seoul, I visited one palace, Changdeok Palace. There are some other palace which is interesting to visit, Gyeongbok P alace, Changyeoung Palace and Deoksu Palace. About museum, in my last trip, I visit Cheongwadae Sarangchae Museum. This museum is modern and comfortable. In this museum we took some interesting picture with "Mr and Mrs President" (as mentioned above) and photo in Replication round table conference. In next trip, I think I should visit other museum, eg National Folklore Museum. Talking about fashion in Korea, don't forget to make a picture wearing Hanbook, Korean Traditional dress. See this picture, all off us look nice in Hanbook Dress! Gamsa Hammida.... (Thank you very much) for reading this article! Just read a book and have an additonal information for paragraft that starting with alphabeth "S" see Korean actor/actress....we can go to Apgujeong-dong at Hangnan District, Seoul, which is famous as a hang out and shopping place for Korean actor/actress.